Lack of financial and technical support and knowledge gaps inhibit sustainable timber industry in Mozambique. Mozambique - BOGOR, Indonesia (23 November, 2012)_In 2010, Mozambican export figures show almost US$49 million worth of timber shipped out of the country bound for China. Chinese import figures show over US$134 million in wood landed from Mozambique. The discrepancy of US$85.4 million is roughly equivalent to the annual income for over 194,000 Mozambicans. So where did the missing logs come from and where did they go? This difference in trade figures is discussed in a recent working paper on the effects of Sino-Mozambican trade relations on forests, which is one of the first outputs of research project on China-Africa relations conducted by the Center for International Forestry Research (CIFOR) in collaboration with the Faculty of Agriculture and Forestry Engineering (FAEF), University Eduardo Mondlane (UEM) during 2011-13. 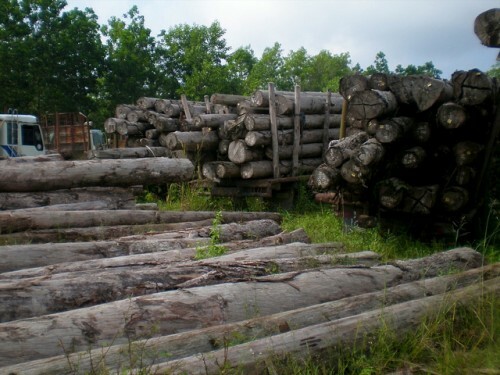 The paper’s authors—CIFOR affiliated anthropologist, Laura German, and environmental economist, Sheila Wertz-Kanounnikoff—say there are a couple of possible reasons for the $361 million difference, between claimed timber exchanged over the last decade. Firstly, Mozambican officials are either “unable or unwilling to fully account” for wood leaving Mozambican ports. Wertz-Kanounnikoff relates this issue to two factors. “There is a lack of capacity in terms of human and capital resources, including weak inter-agency coordination” she says. Wertz-Kanounnikoff’s observation of weak governance within the Mozambican timber industry is hardly isolated. Transparency International ranks Mozambique 2.7 out of 10 on its corruption scale, where 0 is very corrupt and 10 is clean. The World Bank gives Mozambique a -0.39 rating in control of corruption, indicating weak governance outcomes. During Wertz-Kanounnikoff and German’s 2010 research, they found similarly “fraudulent legislation.” Trees felled in Tanzania were being traded on Mozambican permits. However, Wertz-Kanounnikoff is quick to add, the extent to which China may be counting Tanzanian timber as originating from Mozambique is not clear. Both of these scenarios or a blend of the two represent a problem for the Miombo eco-region that Mozambique’s northern forests are a part of, says Louis Putzel, a CIFOR biologist who heads the institution’s three-year-long China-Africa research programme. The disagreement in figures is only an indication of the potential magnitude of the problem. “Knowing where timber comes from is a way for officials to monitor the sustainability of logging at the national level,” Putzel says. “Wood not being recorded by customs is wood is unlikely to be taxed. This means that the Mozambican government is losing revenue on wood that is leaving their shore.” The 2007 TRAFFIC analysis adds that undocumented logging also “threatens agricultural prospects for rural communities” and conservation of biodiversity. The Miombo woodland eco-region is a zone of tropical dryland forest that spans ten South African countries, including Angola on the Atlantic coast and Tanzania on the western side of the continent. The ecoregion has long been recognized for its biodiversity which includes species like cheetahs and spotted hyenas. The irregular, knotted hardwood trees of the Miombo are also increasingly becoming considered valuable timber and a possible basis for local wood processing industries. Tropical, humid environments are home to many tree species that are processed into pulp and plywood. However, the Miombo’s slow-growing woods have unique colours and grains that are treasured in flooring and furniture—products with high aesthetic and monetary value. A local “productive” industry that fashions the precious wood into fine furniture or flooring rather than the current “extractive” industry, Putzel argues, could create a more sustainable economy, increased revenue for cash-strapped African governments and higher incomes for Mozambicans (half of whom live under the national poverty line). “Think of it as a chain, from primary production to retail. The more different actors can be integrated, the more economic value the country is able to capture,” says Mário Falcão, professor at FAEF/UEM and coordinator of the Mozambique country case study. A dialogue with the National Directorate of Lands and Forestry (DNTF) of the Ministry of Agriculture has been initiated on entry points for leveraging more responsible forest management based on project findings. Whether the discrepancy in trade revenue numbers is worth 48 million or 134 million US dollars, the fact remains that Mozambique is exporting ‘first class’ timber species unprocessed, in spite of a log export ban they created in 2002. Under this ban, six of Mozambique’s most traded timber species were classified as ‘first class,’ high value woods that would the country could generate more revenue from if they processed them before export. This work is part of a project funded by the German Federal Ministry of Economic Cooperation and Development (BMZ) through GIZ-BEAF and forms part of the CGIAR Program on Forests, Trees and Agroforestry.